I liked the article “4 Ways To Maintain Integrity When Your Wife Isn’t Around”, by Tito Brown. He speaks about being faithful to your wife and remain obedient to Christ against all odds. The day had arrived. My wife was going out of town for two weeks. The world tells me that this is every man’s dream – so why did it feel like a nightmare to me? While many men would wrongfully relish at the idea of getting time to themselves, I was terrified because I knew Satan is always waiting to destroy. If you were honest with yourself, I am sure you could admit that when you are left on your own – your mind, heart, words, and eyes can wander in directions they do not belong. At least, I know that’s true for me. So how in this world would I survive two weeks alone? Take captive your MIND and make it obedient to Christ. Our minds constantly wander and our thoughts are consumed by many different topics. Baseball, football, work, kids, wife, cars, fishing, beautiful women, beautiful women playing football, beautiful women playing football wearing fishing gear. Okay, Okay, I was just trying to prove that our minds wander. Not only do they wander, but we fantasize as well. Many of us can get lost in our heads, and we have to protect our marriages from our own thoughts. If your thoughts wander… Think of Jesus. Dwell on Jesus. Pray to Jesus. We take captive every thought to make it obedient to Christ. (2 Corinthians 10:5). Guard your HEART, its love is only for her. God wants Christians, young and old to stay pure for marriage. It’s His plan! When a Christian person disobeys God’s calling for them, there is always consequences. These consequences may be emotional attachments that break our hearts, unwanted pregnancies, or a venereal disease. God does not make these bad things happen to us. We make these bad things happen to us because of the choices we make in our life. Let’s choose what God wants. Let’s pray about it and seek God’s will for our life always and forever. Looking back to the past can be both a hindrance and a help. When the past controls us, through guilt or shame, it is a hindrance. When the past haunts us or defines us or points a finger at us, it's not a help. Other times, looking to the past can be fun as we recall and laugh at joyful times. Historians tell us that looking to the past can help us learn from the lessons of others so that we don't make the same mistakes. In addition to his great grace for us at the cross, there are countless daily acts of grace in our lives. God pours out his riches for us in ways we can't fathom. Looking back at the ways he has provided food when we needed, the ways he has comforted us when we've been in sorrow, the ways he has supplied us with wisdom when we had none, these are all acts of grace we can reflect on when we need a reminder. Whenever money has been in short supply, I always remind myself of the days of our early marriage when God miraculously provided for us and I rest in the confidence that God is faithful to provide. Finally, God has established boundaries in His Word. They are beautiful boundaries surrounding wide-open spaces of His blessing, purposed to bring Him glory, allowing us to thrive in life and to keep us safe from harm. Yet we wander. Oh, how we wander… through so many different gates of temptation. We Christians are not to be conformed to this world in the way we think. The world by its advertisements, its conversation, and its philosophy is engaged in a gigantic brainwashing. Not always consciously but sometimes unconsciously, the Christian is beset by secular and worldly propaganda, calling us to live for ourselves and to put things and selfish pleasure ahead of God. The world's sewage system threatens to contaminate the stream of Christian thought. Time yourself the next time you read the Bible and pray. Compare it to the amount of time you spend watching television or surfing the Internet. Is God getting His share of your time and attention? Is the world shaping your mind---or is CHRIST? 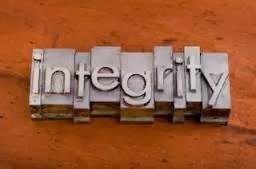 (1) 4 Ways To Maintain Integrity When Your Wife Isn’t Around”, by Tito Brown.